Nothing goes together better than the luxury of BMW and the versatility and off-road ability of a Sports Utility Vehicle. 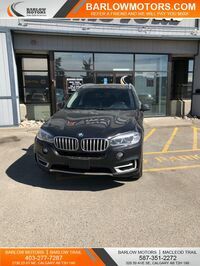 There is no better feeling than having the confidence and performance to take to the trail or conquer the concrete jungle with a used BMW X5 from Barlow Motors in Calgary, AB. Sleek and sporty exterior styling starts with a fierce front fascia and along with stretched and subtle body lines along the profile give the BMW X5 an athletic and aerodynamic road presence. You can learn more about the specs and features found within the BMW X5 and how Barlow Motors can help you drive home in the used BMW X5 that you have been looking for easily and affordably. Where Can I Find a Used BMW X5 Near Me? The BMW X5 features the xDrive engine lineup that delivers impressive performance specs for an unforgettable driving experience. xDrive All-Wheel Drive along with Dynamic Stability and Traction Control provides the BMW X5 with confidence through uncertain weather conditions, rough roads, or tough terrain depending on where your used BMW X5 takes you. Not only does a used BMW X5 offer the performance you are after but it also has all of the cabin comforts and interior amenities that take your morning commute or weekend adventure to the next level. Barlow Motors wants you to be adventure ready in a used BMW X5 and that is why we make it easier than ever before to transition from your current car into the used BMX X5 that you want. We offer easy-to-use online finance tools that provide you with an estimate of your current car’s trade-in value and even allow you to apply for online credit approval. We provide these safe and secure online finance tools to help you save on unwanted time spent at the dealership because we know that your time is valuable. You can come to Barlow Motors and take a used BMW X5 for a test drive today and experience everything that it has to offer first-hand.